Intel ISEF (International Science & Engineering Fair) is the largest pre-college science fair in the world. Students attending earned the right to compete at Intel ISEF 2016 by winning a top prize at a local, regional, state, or national science fair. 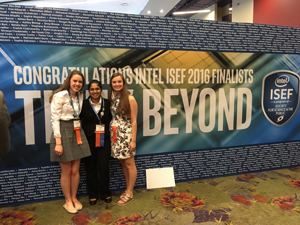 This year 1,770 high school students from 77 countries attended ISEF from May 8-13 in Phoenix, Ariz. Three Hathaway Brown students - Kavya Ravichandran, Margaret Broihier, and Caitlin Coyne - won all expenses-paid trips to compete at ISEF as Finalists by advancing through the Hathaway Brown 18th Annual Poster Session judging in March. Hathaway Brown has been honored to award spots to ISEF each year based on the quantity and excellence of the science and engineering research being performed in partnership with world-class Cleveland institutions such as Case Western Reserve University, Cleveland Clinic, NASA Glenn Research Center, and the Cleveland Museum of Natural History. Kavya Ravichandran '16 works in the lab of Dr. Anirban Sen Gupta under the guidance of Christa Modery-Pawlowski in the Biomedical Engineering Department at Case Western Reserve University. Kavya’s project focuses on developing a targeted therapy for treating vascular disease such as heart attack and stroke. Margaret Broihier '17 studies the role of TREM2 in Alzheimer’s disease in the Neuroscience Lab of Dr. Gary Landreth at Case Western Reserve University. She is under the direct mentorship of graduate student Taylor Jay. Caitlin Coyne '17 conducted a screen on a large compound library to identify new potential candidate drugs for the treatment of Acute Myeloid Leukemia. She works in the lab of Dr. David Wald in the Department of Clinical and Experimental Pathology at Case Western Reserve University under the mentorship of graduate student James Ignatz-Hoover. Congratulations to Kavya, Margaret, and Caitlin!